For weeks now, Joal Traynor has spent part of most days standing on street corners in downtown Albany, holding up a sign complaining about the state Department of Human Services. I’ve talked with him at his house and scanned some of the mountain of paperwork he has collected. And it looks to me that he got a raw deal. The story is sad and highly personal, and while the details are important, I won’t dwell on them here to honor the privacy of others involved. Suffice it to say that Traynor, 37, has had custody of his children since 2005, and the court removed their mother’s visitation rights a few years later. Officials of DHS, however, after two reviews, persisted in a finding of physical abuse. They also placed the girl with the mother who had lost visitation rights before. So sorry, Joal, keep fighting the good fight! Albany DHS can be unprofessional to say the least. Prayers for you. I’ve known Joal Traynor, as he is friends with my son, since high school. He is a good man, and he cares deeply for his children. There are many parents out there who are sorely lacking in good parenting skills. The caseload of the Department of Human Services is extremely heavy, and there is definitely a need for their services. But, it’s a sorry day when you cannot discipline your own children without the fear of them being taken away from you! Each case should be reviewed on its own merit. I know the Department is swamped, but look what it has done to this young man and his family’s life! As a result of this action, Joal no longer has a job. Will he and his family now have to be on the state’s assistance to support themselves? I hope for Joal and his family that this situation is resolved. But, there will always be questions about Joal because of this. Even if it is made public, in the paper, that the accusations were unfounded, there will always be some people wondering if he went overboard disciplining his daughter and what kind of man is he. It is difficult enough raising children, especially teenagers, without the fear of State taking custody of them! So what do we as parents do, let our children do as they please without consequences? That is not being a responsible parent. If there were more parents like Joal, who loved their children enough to teach and discipline them to become responsible adults, the caseload of the Department of Human Services would be a lot less. GO JOAL!! BEEN THERE DONE THAT WITH DHS! THEY WERE TOTALLY UNJUSTIFIED IN MY CASE AS WELL. I JUST DIDN’T KNOW ANYTHING ELSE OTHER THAN JUMPING THROUGH THEIR HOOPS!! UNFORTUNATELY IT HAS CAUSED HORRIBLE MEMORIES FOR BOTH OF MY KIDS AND MYSELF! I PRAY THAT YOU CAN STOP THIS ALL TO OFTEN UNJUSTIFIED REMOVAL OF CHILDREN FROM THEIR HOMES ! So beating your child with a belt and leaving bruises is ok? I think not! It is sad to believe it would come down to getting the belt, but definitely not unheard of. If you don’t believe that sometimes kids need to realize that their actions will have physical consequences than you are naive. Not to mention judgmental, even the author felt that some details are none of his business. Who knows if she physically harmed someone else or harming herself. I really don’t think Joal and his family deserved the punishment they got either especially when it had already gone to court once. Isn’t that considered double jeopardy. Spanking your child twice is not beating…. BEATING a child with a belt is definitely not ok… SPANKING is another story, which is clearly what they said. And does I miss the part that said the child had bruises? GENERATIONS of families used the belt for discipline. While I am NOT a person who believes in abuse I find it ridiculous that Joal has lost his rights. I have been an acquaintance of Joal & his daughter. His daughter always came to school clean, groomed, fed & demonstrated true love of her father. Even tho Joal’s job was in corrections he was a gentle, kind man when I saw him at school. have called you (as mandatory reporters) Nothing, not one thing was done for the children that were reported! Children that were obviously not in a stable places. Please check out ALL the details & help the chronic needed children out there. Children who are left for hours being neglected, children whose parents are obvious smokers, drinkers & drug abusers. Parents who repeatedly get arrested for these things but still retain custody. That is what I see where I am daily. Joal I am sorry this has happened to you & your family. I am hoping things return to normal soon. And your evidence he left bruises is from WHAT? i survived getting spanked with a belt many many times! its parents and people like you which is why kids are so out of control now a days! Where does it say he beat her and left bruises? “Last November, he twice spanked his then 13-year-old daughter with a belt” He spanked her, not beat her. DHS holds way to much authority and power, and likes to fabricate lies — making mountains out of mole hills. I feel for him, and my heart breaks. Your retarded to think that. My parents spanked me and my brother. Well desereved too most of the time. A spanking is different from abuse get it straight. None of you older folks would have been raised by your parents if they took you away from a simple spanking. I know most had a worse thank a spanking so get over it. Let your kids runs wild without proper discipline, see how long they can go before making into the system themselves. Its not like its a sick pleasure as a parent to spank their beloved child, but a little fear to prevent worse things later on from happening is important, it kept me together growingnup ccause it made it so I never wanted to mess up. A lot off us were spanked with a belt and we turned out fine. Instead of passing judgment get a life! Kids these days. Run and tell, get parents in trouble. I smell foul play. His suit is appropriate in lieu of other avenues. Then the courts can decide on the basis of the law. There is a big difference between “beating” a child and “punishment”. Obviously DHS hasn’t seemed to figure this out. And why are they above the law? And why can their punishment be unjust and so severe? Who regulates DHS? They obviously need a spanking. getting the belt keeps them inline if you don’t they just run wild and cause problems till it gets the law involved and who gets the worst of it the parents do. Then you get to answer to a putz that sits behind bench and tell him I told them to stop it.. Hell that didn’t work did it.I remember growing up in the late 60s on and it was a lot more peaceful back then when a spanking is something you tried to avoid by doing the wright thing. Tell me I’m wrong. abuse is abuse we all get it and watch for it, but a spanking be it a belt or wooden spoon is not abuse you goody two shoe. Does Joal have legal counsel? Good for you Joal! 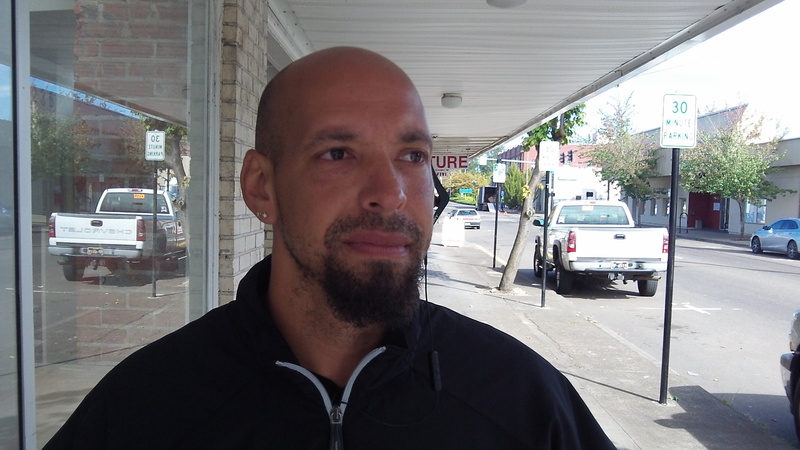 I think maybe after working in Oregon Youth Authority maybe Joal has seen a lot of troubled youth and is trying to set his children on the right path. Kids are out of control anymore because we are not allowed to discipline our children. I spanked my kids, and popped them on the mouth when they would talk over me when they were in trouble. Butting into families without problems is just job security. There is nothing wrong with spanking your child, even with a belt, that is NOT child abuse. it is never appropriate for an adult to strike a child. Someone who would beat a 13-year old child with a belt should be held accountable. Thanks so much for your work answering those questions many of us have about the town we live in. Your website does much to preserve the small town “feel” that caused me to move here many years ago. I hope you have a good set of rain gear so you can keep it up in the months ahead. Sad for all involved….do not understand how DHS could place the daughter with a mother who’s visitation rights had been lost? Unfortunately there are no winners in this case…I fail to understand why DHS did not work with the father instead of taking the actions they did? I agree with Bob Woods about filing a suit and letting the Court decide after hearing from all parties. Thank you for writing this story, Mr. Hering and for writing it with the sensitivity and accuracy that you did. Joal and Carmen are great regulars of mine and good people..bad things happen to good people! Don’t let our societys faults get you down when you know you have the best of intentions! Love you guys! I spoke to Joal today. He does have legal counsel. He will meet with Rep. Olson tomorrow and Geltser when she returns from travel. Legislators must keep unelected bureaucrats from this kind of abuse. Sounds like the usual bureaucratic b.s. I feel sorry for this father. My mother spanked my brother and me. We were not abused. We were punished for breaking the rules. This sounds similar to me. It seems to me he deserves to have the case reviewed, especially since he lost his job. Spare the rod and spoil a child. DHS is not about family it is about disrupting court orders. I’m willing to bet that the folks who say that physical punishment of children is necessary, were all physically punished as children. Some here say just that. That does not mean that children cannot be raised perfectly fine without physical punishment; it just means that you have no personal experience of a family that is able to raise children that way. Each family has their own dynamics. The vast majority of parents only want their kids to turn out well. If that can be achieved without hitting, wouldn’t that be preferable? And don’t we as a society need to be concerned for those few families that truly damage and even kill their children? Like the woman who threw her kids off the Yaquina Bay Bridge? Or the baby who is shook so hard when crying it dies of brain damage? We have laws in place to address the extremes. We also get angry at the people in DHS when a kid is attacked, starved or killed “for not doing their job”. As I said before, this appears to be going to a court to be determined whether the situation is a violation of the law. That’s how it is supposed to work. Thanks for the story. I have been waiting for the D-H to prints something about this man who I’ve seen on my morning commute for weeks. I’m still waiting. Worked with Joal at Oregon Youth Authority. He was a wonderful father and employee. He treated all including some mouthy, rude and disrespectful youth with compassion and care. I feel if he was taken to the level of spanking it was really called for. … Joel you have my sympathy and god bless you for trying to instill some control over your daughter’s bad behavior. You tried whether accepted by some or not. This society has way too many that do not. On a note of DHS, This article about Joal makes me want to ask why Joal gets this when two weeks ago, a young man (who I have dealt with personally) was arrested his second time, panhandling with his three children. Each time police called his sister who has children removed from her to come and get the kids. Last week I myself called the police, because he was sleeping in our community with no blankets nor food with the kids (it appears that he went to his sister and got the kids, which she had no permanent home for them either). In talking with the sister and police, DHS was contacted, reports filed on the filth and lack of care these kids were getting…. and yes I saw him in Salem panhandling on Market on freeway exit just yesterday. His three kids jumping around on and off curbs, heavy traffic. One is old enough for school. I was standing right there when the officer asked him about school for the oldest. His response was, “I home school him.” How come, DHS, it is because you can work in air conditioned places to hassle the parents who do raise their kids properly, you got time to hassle Joal and not one who many times you been contacted about. His 3 children are 7,5 and 3. Spanking and beating are two very different things. Unfortunately our system is influenced by badge heavy DHS workers that will lie, falsify documents, “lose files”, and neglect facts just to get a victory. We all have the right to our opinion, just as we have the right to parent our children. Hold on to that because you never know when that will be taken away. I have been a parent/ father for 19yrs straight, not a some time dad, but a full time father! DHS does have great polices to protect children, but it is when people choose to stray away from them and lose the professional aspect of their job when families are destroyed and children are endangered. DHS made a mistake, but they do not want to take ownership, but in due time they will be exposed, the truth will come out!